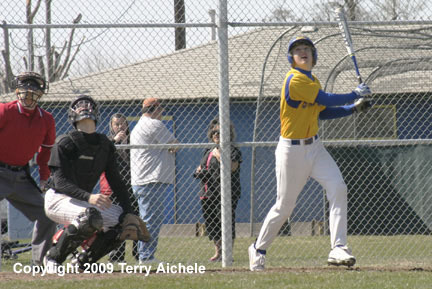 Jack Taylor of Stanfield takes a swing during the Thursday game with Dufur. 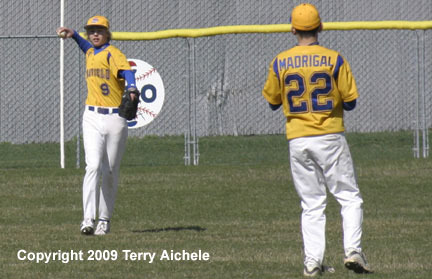 STANFIELD - The Stanfield Tigers defeated the Dufur Rangers 11-4 on Thursday, March 26, 2009. It was a nice day for early spring baseball - bright sunshine, blue skies, a hint of a breaze and a temperature of about 50 degrees. Tiger starter Quin Grogan took the win and Ranger CJ Forrest the loss. 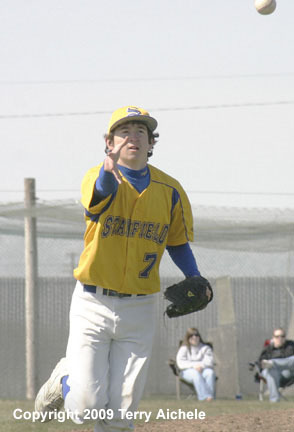 Mike Fisher of Stanfield went three for four. Fisher, Mario Madrigal, Derek Monkus, and Jack Taylor each had two RBIs. The Dufur Rangers scored in the top off the first when Angel Trujillo drove in Hunter Woods with a triple. Cody Frischman scored on a long shot to center field by Steven Begay. The Tigers came back in the bottom of the first when Trey Blevins scored on a hit by Mike Fisher. The next scoring occured in the bottom of the third when Derek Monkus laid down a sacrifice bunt bringing in Blevins to tie the score at two all. Quin Grogan stole home on a wild pitch to give the Tigers the 3-2 lead. Dufur tied it up then took the lead in the top of the fourth. The tie came on a big hit to left field by Begay which drove in CJ Forrest. The go ahead run came on a hit driving in Begay giving Dufur the 4-3 lead. Stanfield came right back in the bottom of the fourth. Tigers had Davin Bailey and Tyler Hawkins on base when Mario Madrigal hit a long shot to center field driving in Bailey and Hawkins to give Stanfield the 5-4 lead. Madrigal stole home on a wild pitch to take Stanfield to a 6-4 lead. Fisher then drove in Blevins giving the Tigers the 7-4 lead. Then Jack Taylor hit a long fly ball deep into left field bringing in Grogan and Fisher stretching the Tigers lead to 9 to 4. 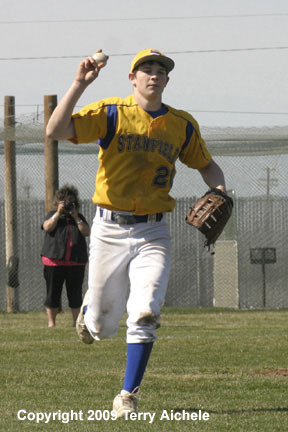 Stanfield scored again in the bottom of the sixth. Fisher hit a triple into right field bringing in Grogan from first base. Monkus grounded out bringing in Fisher. That gave Stanfield the 11-4 lead which would become the final score. LEFT - Stanfield starter Quin Grogan. 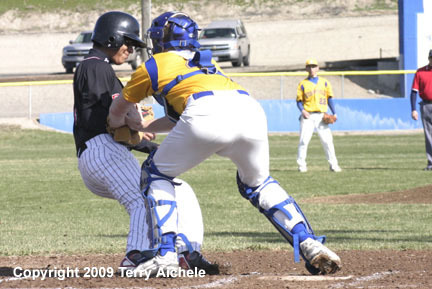 RIGHT - Stanfield catcher Mike Fisher tags Mario Trujillo of Dufur. LEFT - Stanfield left fielder Derek Monkus throws to short stop Mario Madrigal. 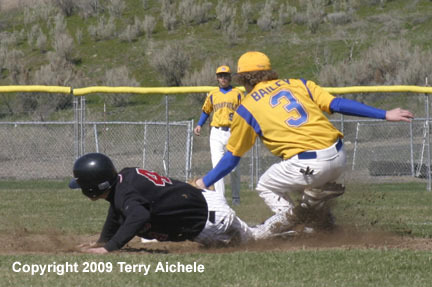 RIGHT - Trey Blevins slides home safe on the tag attempted by Dufur's Steven Begay. 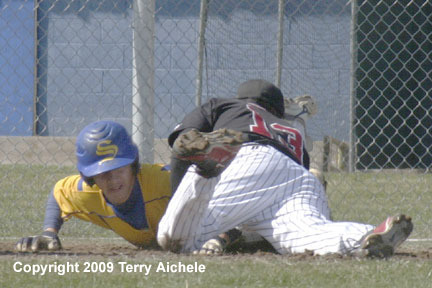 LEFT - Mike Fisher of Stanfield slides into home safe. RIGHT - Devin Bailey of Stanfield attempts to tag Hunter Woods of Dufur at second base. 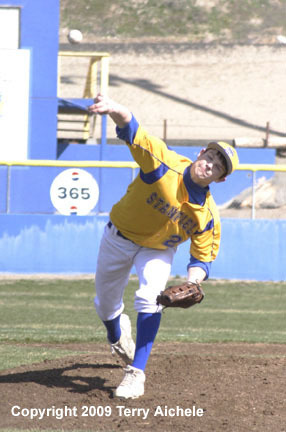 LEFT - Devin Bailey of Stanfield gets out of the way of the slide of Hunter Woods of Dufur. 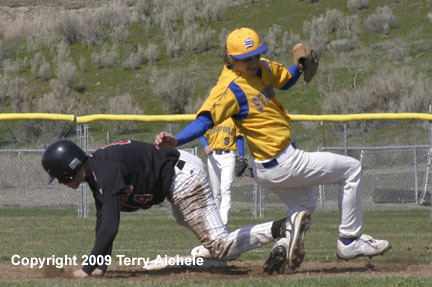 RIGHT - Tyler Hawkins of Stanfield slides into second base. LEFT - Quin Grogan of Stanfield moves to first base after fielding a grounder to make the toss for an out. 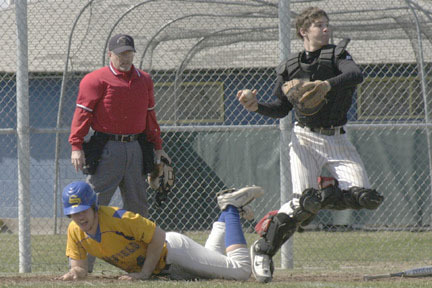 RIGHT - Derek Monkus of Stanfield along with the Dufur catcher and umpire watch to see if his hit is going fair or foul.